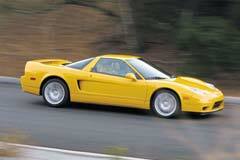 The Acura NSX was regarded as the ultimate sports car back in the 1990’s. This model was in fact launched in 1990 but it remained in production with various facelifts and upgrades till 2005. Buying a used Acura NSX in one of the various versions is not a difficult task as many dealerships will have one available. The vehicle came as a 2-door coupe model. Equipped with a mid-engine coupled with a rear-wheel drive layout, the Acura NSX is great for high speeds. They were produced in 4-speed automatic as well as 5 and 6-speed manual transmissions. Various features make this car one of a kind. Many sports-car lovers praised this car because of its body lines and low height. Through the years the Acura NSX received several positive reviews and it is set to be re-launched in 2015. In the meantime, you may wish to try out a used Acura NSX to get a better feel of what this car is capable of on the road. 1997 Acura NSX TARGA Acura NSX 1 of 21 Produced. 2019 Amelia Island Show Winner 46k miles Exc. Cond!